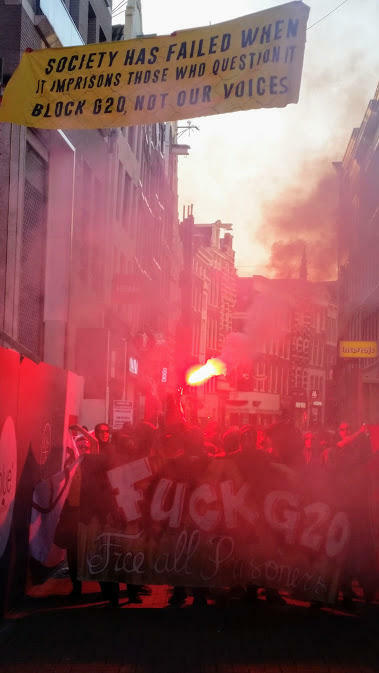 Earlier tonight people took the streets in Amsterdam, Netherlands, to protest in solidarity with the NoG20 prisoners. Image: Tonights solidarity demo in Amsterdam, Netherlands. Image by Indymedia NL. Earlier tonight people took the streets in Amsterdam, Netherlands, to protest in solidarity with the NoG20 prisoners. Earlier this week a Dutch comrade was convicted to a 2 years and 7 months long jail sentence. Anti-Fascist Action (AFA) Nederland wrote on their Facebook page: “Earlier this evening more than 80 individuals walked a short but loud and powerfull spontaneous demonstration through the city centre of Amsterdam in solidarity with all arrested and prosecuted in connection to the G20 summit in Germany. The 21 year old Dutch comrade was accused of having thrown two empty beer bottles at one cop after hundreds of riot cops blocked and attacked the “Welcome to Hell” demonstration on July 6 in Hamburg. There was no evidence against the comrade. During the trial it became clear that the main “proof” are testimonies by 2 cops who described the individual who threw the bottles as a person with dreadlocks. The 21 year old that was convicted on Monday has no dreadlocks. His laywer will appeal. On Tuesday a 24 year old Polish comrade was convicted with a 6 months suspended jail sentence. It isn’t even clear if this comrade was even planning to join the NoG20 protests. He was arrested in downtown Hamburg on July 8, about 70 minutes before the final and peaceful NoG20 demo started. He was accused of having a fire cracker, pepper spray, “typical scene clothes”, diver eyeglasses and 2 marbles in his backpack. His lawyer will also appeal. Another 108 people are currently still awaiting trial, as far as we know 28 people are still in pre-trial detention. On September 3 there will be a demonstration to the JVA Billwerder prison in Hamburg. For more details about Sundays demonstration, click here.